The benefits of energy efficiency improvements are well known: lower electricity demand and utility bills, along with good-paying green jobs. But one analysis shows the return on investment from efficiency investments may be even more massive than previously thought. Energy efficiency retrofits carried out in 16 cities across 8 Southeast US states from 2010-2013 created a 387% return on investment (ROI), according to a recent report from the Southeast Energy Efficiency Alliance (SEEA). 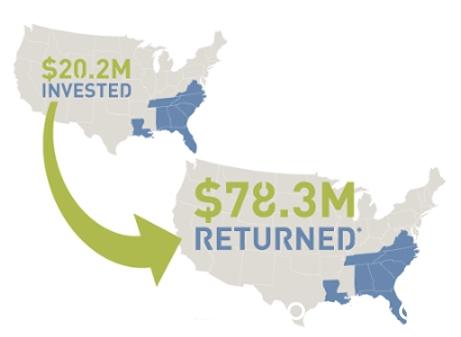 The SEEA energy efficiency retrofit effort spurred $3.87 million in economic input and 17.28 new jobs for every $1 million invested, an intense spurt of green economic growth in new spending, reduced energy costs, and associated spending created by newfound money through worker income or utility bill savings. SEEA’s energy efficiency program was seeded by $20.2 million in funding from the U.S. Department of Energy and targeted homes and businesses in Alabama, Florida, Georgia, Louisiana, North Carolina, South Carolina, Tennessee, and Virginia. At the program’s conclusion, more than 10,000 building energy audits were completed, resulting in more than 6,000 residential and commercial building retrofits. That output was good enough to place SEEA’s effort sixth among 41 DOE-funded programs nationwide. “While this region has traditionally lagged the rest of the country in energy innovations, the results of this ‘grand experiment’ in community based energy efficiency programming have validated the powerhouse economic effect of energy efficiency,” said Mandy Mahoney, SEEA President. The analysis was conducted by the Cadmus Group using advanced economic modeling software comparing the effects of program-related spending on the regional economy to a hypothetical baseline in which these energy efficiency investments did not exist across the economies of the eight states. A wide range of economic benefits contributed to the overall $78.3 million in regional economic output created by SEEA’s energy efficiency upgrades. $55.7 million in economic output and 240 jobs were created through direct effects from program spending, while $22.2 million in economic output and 106 jobs were created via direct effects like efficiency goods and services. Induced effects from households or workers spending newfound money on consumer goods or services created an additional $366,471 in economic impacts. While SEEA’s report notes avoided utility fuel costs and avoided capacity costs factored into the analysis, the figures focus on average price savings for the entire region by month but do not provide total cost savings for the region. Program investment levels varied by states, and every state experienced strong economic impacts, but parsing the data shows the greatest benefits came in one of America’s most energy inefficient states – Florida. The Sunshine State ranked first in three out of four metrics: 18.69 jobs created per million dollars of program investment, $1.5 million in labor income generated per million dollars of program investment, and $2.6 million in value added per million dollars of program investment. 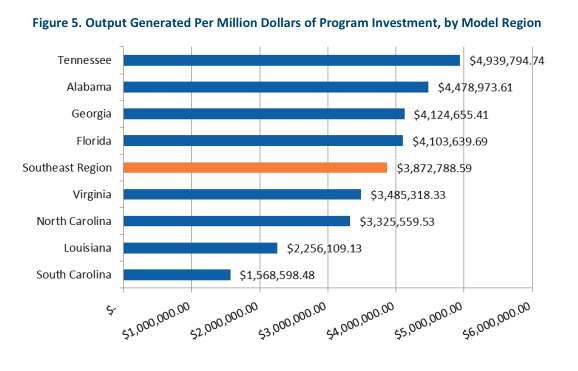 Tennessee ranked first in output generated per million dollars of program investment with $4.9 million economic activity. SEEA’s analysis certainly outlines the potential for energy efficiency to improve the Southeastern American economy, but the 387% ROI is made even more acute by considering how inefficient the region has historically ranked. Of the eight states SEEA’s program targeted, only North Carolina (24th) ranked above the lowest 40% of all states in the American Council for an Energy-Efficient Economy’s (ACEEE) 2013 State Energy Efficiency Scorecard. Enthusiasm for More Energy Efficiency Investments? Fortunately, SEEA’s retrofit program and the resulting ROI may be the start of a larger trend toward a more energy efficient-Southeast. SEEA notes new efficiency rules and utility-run efficiency programs in Louisiana and Mississippi, as well as an additional round of SEEA-led energy efficiency grant programs as positive signs for 2014 and beyond.